Naxxramas is alive once more, filling it’s halls with dreaded demons and spawns of the underworld. It is up to us to gather our strength once again and put an end to this wretched hell. ‘Curse of Naxxramas’ is the latest expansion from Blizzard for Hearthstone and will go live soon. Adventurers will face familiar villains and fight to unlock special cards and other magical items. If you log in and visit the first hall during the month long launch event, you will receive the first wing for free. After that, additionally wings can be purchased at a reasonable price with both real life currency or in game gold. You can take a peak at the US pricing below, or click here for EURO pricing or click here for AUS pricing. Keep in mind that purchasing the wings all at once does not guarantee unlocking the content immediately. The current schedule is for one wing to be released a week and Hearthstone players who purchase the content prior will be granted access to the challenges as soon as the wings are live. 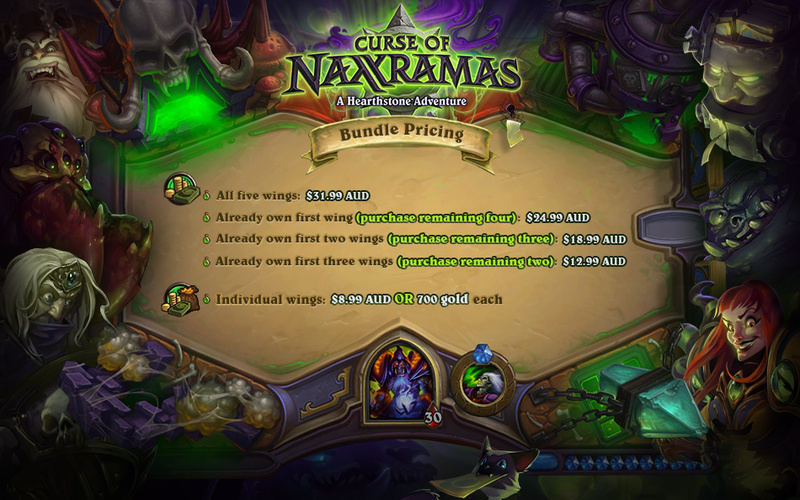 Bundle pricing allows for players to unlock wings as they can, or in bulk. If you purchase one wing with in game gold, you can choose the option to unlock the remaining wings, or just one at a time. This gives full control over flexibility with your own funds or in game gold flow. Once adventurers have beaten all wings, Heroic Mode will unlock allowing players to go back and replay the content on a more advanced level. This will unlock a new card back for your deck, to let other players know that you mean business! Excited to revisit Naxxramas in ‘Curse of Naxxramas’ for Hearthstone? Let us know what you think in the comments below!